I hope your Christmas holidays were joyous and full of happiness with the ones you love. In early 2018, I worked with narrators to produce “Dangerous Heat” and “The Treasure” into audiobooks at Findaway Voices. Today, one of those narrators, Hugh Bradley, is here with me to answer some questions about being a narrator. 1) What did you do before you became a narrator? I’m a classically trained actor, and have been on Broadway and toured all over the world. I still perform on stage from time to time, but most of the time these days I stick to recording, and producing and directing for the stage. 2) How long have you been narrating audiobooks? For just about 10 years now. The industry has changed a lot since then! 3) Do you work for more than just one audiobook company? I do. You can find titles I’ve narrated across most of the platforms out there. 4) Do you work at home or a studio? I have a studio at home, as well as a travel rig I take with me when I’m away from home. 5) If at home, what kind of set up do you have? I run a few different mics, mostly Sennheiser, at home. I also use the portable Audio Technica’s 2020 USB, which I’m using more and more often because it’s just so dang convenient. 6) What helped you decide to be a narrator? My agent first got me into it. I think being a theatre actor made it an easy transition, and being able to do different accents and character voices was an asset I already had from that field. I also am a voracious reader of all genres, so that made going to work a fun thing as well. 7) What do you enjoy the most about being a narrator? At first, the work itself - but like I mentioned above, the ability to play a range of characters I would never be able to on stage or screen certainly is incredibly enjoyable. Finding each character’s voice within my own, while keeping it believable or at least enjoyable to the reader’s ear, and within the sensibility of the world or genre the author has created is particularly fun. 8) What genres do you narrate? Primarily romance, but I do a lot of work with various English accents, as well as historical novels, and some science fiction. 9) Do you have a favorite genre? I’ve been narrating a lot of historical English ‘high period’ romance novels in recent years. The Dickensian type characters in those can be a lot of fun. 10) What is your process when you are hired to do a new project? I often start with finding the right tone for the narration. Once I find that, I zero in on the protagonist(s), keeping within a range that I can replicate over the course of recording for hours on end every day, and so that it sounds naturalistic within the scope or style the author has created. And then mapping out the novel so those choices are consistent is my next step. I often use different colored pencils on a hard copy or highlight colors on a pdf to help with that, especially if it’s dialogue with multiple characters in one scene. 11) Do you do one project at a time or do you mix? I prefer to do one project at time. It helps with consistency for the voices, and also, I like living in the world of a novel without mixing as a reader. Sometimes that doesn’t happen given busy recording demands, however. 12) Do you have contact with the author prior to starting the project? I prefer to. It helps me get a sense of the tone and style, and I always ask how the author hears the characters in their own heads before I send a sample version for them to approve. 13) What type of information from an author helps you get into character for the stories? I many times will ask for a famous actor as an example of who they might cast in the movie version. That often seems to be the most efficient way to dial in a certain vocal quality or style of performance. 14) What do you draw on for the emotions you bring to each character? Backstory is important. If it’s not in the writing itself, I’ll ask an author a character’s history to tease out any emotion or stylization. 15) Do you do different voices? 16) How do you approach female voices? For me, it’s not about mimicking or trying to approximate a typical female “sound” or vocal range, but more about tambre and intonation. Given that I have a deeper voice as a baritone, finding a realistic balance for female characters is important. I want to be able to give a full a range of emotion and pitch as I would character with a vocal range closer to my own, without them coming across as comedic or affected. I often times will intentionally lighten the deeper resonance in my voice, which means having a good microphone that I can get closer to becomes even more important. 17) Do you do accents? 18) How many different accents can you do? I’d say I regularly use 4 different accents in most of the audiobook work I do - a neutral American, a posh or character British, a more standard British (RP), and a general southeastern/southern American. That said, I can do most accents fairly proficiently after some study and polish. I grew up in Germany as a kid until I was a teenager, studied opera later for undergraduate where I also had to learn Italian, French, and Russian, and later went to university in London to study acting, where accent work was a very large part of the training. I specialize in English (UK) language accents ranging from RP (Received Pronunciation) to Northern, Scottish, and various Irish. I’m also fortunate to have extended family in the American South and Appalachia, so I’ve had those accents in my ear for most of my life. It’s very much an extension of music and musical ear training, as far as I’m concerned. 19) How much contact with the author do you need during a project? I prefer to review the process as we go, so as much as the author and I feel we need. I find that we generally hit stride after a few chapters, and that makes the process pretty streamlined once we do. 20) Have you ever read a scene that made you uncomfortable? 21) How did you handle it? In terms of content, I’m not the author, so I don’t have many qualms about that. This is going to sound incredibly snobbish, but the most uncomfortable non-content related moments have been where the writing is grammatically incorrect or just not well written - a horrible thing to say, I know. But that’s where as an actor, you have find a way to make it work. 22) Are there scenes that you absolutely won’t do? If it’s justified within the scope of the world, or the character’s journey that the author has created, then I don’t see any reason not to. That said, I’m not a fan of gratuitous violence, especially against children, women or animals, so I have turned down work based on that before. I’ve narrated some pretty gory thrillers and murder mysteries, but those were justified given the genre. 23) Have you ever done a book where you worked with another narrator? I have. Often times an author will ask for that if a novel is told from two points of view, mostly a female and a male character in the same story. 24) How did that work? Did you work in the same studio or separate? We worked in separate studios. We created a spreadsheet for all the characters and agreed on descriptions for each one’s voice before we began. It took a little doing, but we intentionally weren’t trying to imitate each other. It was more about getting a general similarity when we were voicing the same characters from the other narrative point of view. We hit stride pretty quickly, and it was a rewarding experience. I can sometimes find this jarring as a listener if the narrators aren’t in sync with each other’s style, but as a narrator, that’s the rewarding part of the challenge of dual narration. 25) Do you ever get asked to do more books in a series? I do. And I love it - being able to live with a character for more than one book and see how they grow and change is fun. You don’t get to do that with many other forms of storytelling. 26) How long does it take to complete a project? Totally depends. Books that are really complicated with lots of different characters and styles can take several weeks to finish. A good general rule is for every one hour of finished audio, it’s between 1.5 to 2.5 hours of studio time, though that can be whittled down if you have a fairly straightforward read. 27) I know what I am like to work with, and you survived it. ☺ Has there been times when you have had to stop working with an author? Ah, Sloan, you were awesome to work with. Totally clear, and enjoyable notes that made figuring out the character’s voices and chemistry even more fun. To date, I’ve been very fortunate. I haven’t had to stop working with any given author on a project, and that’s after several dozen audiobooks. I have had to postpone a few when I had a bad injury a few years ago, but nothing that stemmed from a creative difference. I’ve also developed a pretty solid checklist over the years when it comes to different styles of audiobooks, so I like to think I’d be able to accommodate a writer’s needs, while maintaining my own integrity as a voice artist. 28) What happens when you stop a project? Cross that bridge if it ever comes! 29) Do you help with promotion for the finished projects? Absolutely. I enjoy the process and getting word out to fans, and meeting new fans! 30) If so, what kind of promotions do you do? Everything from questionnaires like this, to podcasts and more. So far, no television appearances, but it’s a new year ahead and you never know! Hugh and I would love to hear from you. 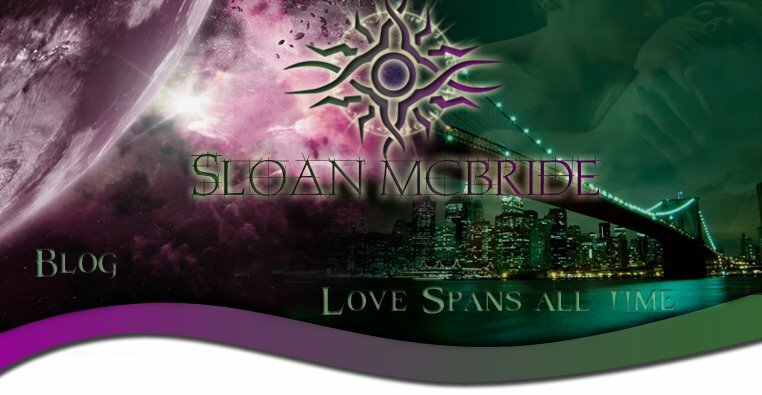 You can leave comments for Hugh at https://www.facebook.com/hughbradleyvoice/ and for me at https://www.facebook.com/sloan.mcbride or https://www.facebook.com/sloanmcbrideauthor/. For more information on Hugh Bradley and other narrators you can visit Findaway Voices. For more information on my other audiobooks, please visit Sloan's Books.